1. In recent years, the Baltic Sea area has been turned from being an area of low tension into an area of high tension between Russia and the West. The reasons are Russian policies in Ukraine and elsewhere and NATO’s and EU’s responses. This is a dangerous development for all the Baltic Sea states which easily may get out of hands. What we witness is a Cold War 2 situation here but without some of the restraints that existed during Cold War I. 2. In this situation, it is to my mind essential that Sweden and Finland should not become members of NATO since that undoubtedly would increase the tension further and heighten the risk of war involving our countries. 3. There are a number of measures that can and should be undertaken to de-escalate the tension. It is important to remember that tension and conflict are grounded in the minds of people – in their memories of historical injustices, in their fear and prejudices of foreign people. To overcome these feelings, security must be built from the bottom-up through people-to-people contacts, not only top-bottom through government agreements. Dialogue, trying by all means to understand each other, is much more important and effective than sanctions and boycotts. Almost never has a country been successful in imposing its will on another people for any length of time. United States in Vietnam or in Iraq or with respect to Iran is a case in point, the Soviet Union in Afghanistan or in East Europe another. 4. Here is a list of things that should be undertaken to lessen the current tension. · Facilitate people-to-people contacts by limiting the use of visa restrictions. For instance, Russia nowadays allows cruise passengers to visit S:t Petersburg for three days without visa if they stay overnight on board the ship; there is also some liberalization for short-time flight passengers. We should at least allow the same procedure for Russian cruise passengers visiting EU ports, especially in the Baltic. Further, the now frozen talks between the EU and Russia on visa liberalization should be resumed. · Make better use of the CBSS and its resources, where all Baltic Sea states are members. The CBSS is just now actively considering new measures to further enhance cooperation in the Baltic Sea area. With Russia being an active member of this body, this has special importance. Likewise, the Northern Dimension structure should be made better use of. By the way, Belarus should be invited to join the CBSS; several non-Baltic Sea states are already members. · Sea rescue and sea surveillance is a very important issue for all Baltic Sea states. Some cooperation is undertaken, especially after the Estonia ship catastrophe in 1994 but more should and can be done. Russia is for example not a member of the Sea Surveillance Cooperation Baltic Sea (SUCBAS), a platform to exchange vessel data and reports. It should be made a member and a Naval Rescue Network should be established. · In the last two years, we have seen a dangerous confrontation in the Baltic Sea area between Russian fighter planes and warships and those from NATO countries and from Sweden and Finland. Ugly incidents may happen at any moment. Therefore, NATO and its partner countries should negotiate an agreement with Russia to uphold certain “decent distances” when aircraft and ships come too close to each other. There is also a need for an agreement about using transponders on board planes in this area. · In the so-called Vienna agreement from Cold War 1 on CBM measures, there are a number of proposalsthat should be re-enacted, for instance relating to the holding of military exercises. CFE 2 on conventional force reductions never entered into force after the break-up of the Soviet Union. This means that there is a certain lacuna with respect to force levels in the Baltic States area and in Poland, which should be looked at again as should be the Russian flank agreements. This also relates to the stationing of NATO forces and equipment in Eastern Europe according to the NATO-Russia agreement of 1997. · Another area for serious arms control discussions involving our area relates to tactical nuclear weapons. Such weapons are stationed in western Russia and also in some West European countries. So far, no force limits have been agreed. · Kaliningrad is an important area in its own right. From a Western point of view it would be important that there would be more transparency with regard to Russia’s military dispositions in this area. At the same time, the population in Kaliningrad with its outlook to the West should be given better opportunities to engage with the populations of the Nordic countries. There used to be direct ferry and flight services to Sweden and Denmark but not any longer. The regional visa removal between Kaliningrad and Poland is a good example. · During the 1990s we saw several successful, and some not so successful, examples of twinning between municipalities in the Nordic countries and in Russia. The concept should be renewed with government support. It is not reasonable that the municipalities themselves should bear all the costs. A successful model is the regional cooperation in the Barents Sea area. 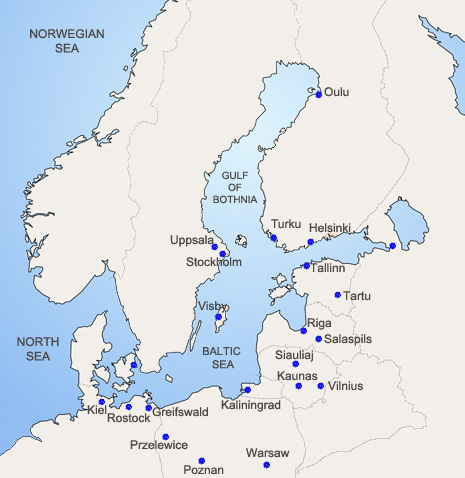 When a functioning twinning is difficult to establish between municipalities in the Nordic countries and Russia, one might consider increased government support to organizations such as the Union of Baltic Cities (UBC) or the Baltic Sea States Sub-regional Cooperation (BSSC) An interesting and more intriguing proposal would be to try to make use of the large Russian ethnic minorities in Estonia and Latvia as good-will go-betweens in the relations between Russia and the Baltic States and generally with the EU. · A promising development would be to develop the use of the regional strategies which are incorporated in the EU Baltic Sea strategy – the inter-reg programmes – and link those to the Russian strategy for social-economic development of north-western Russia.